This is my first attempt at making a string quilt. I really enjoyed making it and using up all the scraps I had accumulated. Now I want to make a color controlled one like everyone else has been making. They are so pretty. 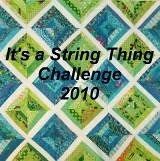 This one is going to Journey of Hope a charity for children my guild Cotton Boll quilters supports. Love your scrappy strings Nancy. I really like how the white strip makes a statement.